Located in Orlando's luxurious Vista Cay community, this 2001 sq. ft. Monterey condominium has a spacious layout to include 3 bedrooms and 2 baths. This condo will comfortably sleep 8 guests with a Queen size bedroom suite, as well as 2 full beds in the second bedroom, 2 full beds in the third bedroom and a convertible sofa in the living area. The master bath includes a garden tub with separate shower and upscale vanity area. As a bonus, the condo was professionally decorated and offers a 50' plasma TV with a Playstation 2 for your entertainment. The condo has a fully equipped gourmet kitchen, laundry room with washer and dryer, and a relaxing lanai. With granite countertops and beautiful moldings, you will never want to leave this lavish condo. Conveniently located near all the attractions and convention center, these accommodations are ideal for all size families as well as business travelers. The comfortable living area has a full entertainment center with a 50" plasma TV, surround sound, Playstation 2, and cable including HBO. This is where you sit back, relax and think to yourself 'why have I stayed in a hotel room, when this condominium offering a generous layout, gorgeous furnishings and all it's comforts of home is available'? Entertaining, cooking and being able to share private time together with friends and family is fun and enjoyable. There is no need to miss out on any of the conversation, when using the 'open plan' fully equipped kitchen and dining area! The large round dining table also doubles for a great conference table for those in-house business meetings. 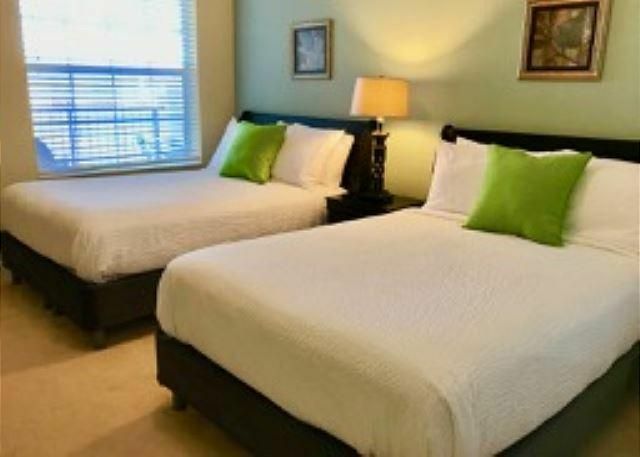 Unit amenities include towels, linen, coffee maker, iron, ironing board, hair dryer, microwave oven, refrigerator, electric stove, dishwasher, electric toaster, central air/heat, dishes, cookware and utensils. Also available are washing and drying facilities. Safe available in the unit and included with rental. For your pleasure and enjoyment, the resort amenities include; a clubhouse, tropical lagoon pool and spa, children's pool, sports court, fitness center, games room, movie theater, internet library, meeting space, elevators, a concierge service and gated entrances. A beautifully landscaped walking trail and a number of golf courses are nearby! Restaurants, shopping, water parks and Orlando nightlife are just around the corner. The community of Vista Cay is located on the beautiful Lake Cay , situated right next to the Orange County Convention Center and only a short distance from Walt Disney World, Universal Studios and SeaWorld Adventure Park and even closer to SeaWorld's Waterpark, Aquatica. Vista Cay at Harbor Square is located in Orlando 's newest development, Universal Boulevard and is at the center of some of Orlando 's greatest experiences. Not forgetting, that this wonderful resort is only a short drive from Orlando International Airport. We were in town for the US Open Volleyball Championships and the place was amazing. The ease of the paper-work and the coordination of arrival was painless. The pictures did not do the place justice. It was large, clean, and bright. Everyone on our team who came to visit us commented on how nice the property was. It was in walking distance to the Convention Center, Grocery Store and smaller restaurants. We easily accommodated the team, their family members, and friends on two of the nights for dinner. We had 17 people comfortably sitting in the open floor plan without feeling cramped. Access to the resort amenities was provided and the in suite laundry was invaluable to clean the uniforms daily after playing. It made for the most enjoyable Nationals we had ever attended. I would not hesitate to use this again or recommend this property to anyone looking for a great place to enjoy Orlando. I cannot say enough great things about the property and how enjoyable it made our visit. My overall impression was great. We were a full house and I felt that there was enough room for the entire family to relax after a long day of sight seeing and attractions. The resort/apartment was well kept and welcoming. The pictures dont really do the apartment justice. It much nicer in person.